I love a taco. They are quick and comforting and a great way to feed many mouths without too much effort. But after numerous nights of seasoned ground beef, chopped iceberg lettuce, and yellow corn tortillas – you know, the standard – a girl’s palate can begin to desire something more. Something exotic and unexpected. Something like fried squash blossoms and tilapia. As I’ve said in past posts, there are two key tricks to successfully cooking low sodium food. The first is to find flavor elsewhere, whether it is in your ingredients, spices, fresh herbs, or condiments. The second, and less obvious piece of advice, is to surprise your taste buds with textures and flavor combinations that they didn’t expect. The more you can keep your taste buds (and fellow eaters) guessing, the less they will be looking for the salt. So with those two pointers in mind, the blogger group – with SF Tao of Pao and Farm and a Frying Pan – decided to take on a different kind of taco. Ms. Pao made an ingenious farmer’s market salsa of finely diced tomatoes, bell peppers, jalapeno, cilantro, avocado, cucumber, and I believe a few nectarines. It was sweet, cool, and crisp with a few flavor surprises. Ms. Pao also fried up fresh tilapia with a cumin, cayenne, and black pepper crust. Simple enough to not overpower the fish, but spicy enough to match the rest of the meal. Then, there was my contribution. Three buckets of fresh squash blossoms (which, if you’ve never seen before, are quite beautiful) that I picked up from Yerena Farms at the SF Ferry Building Farmer’s Market. To prepare the squash blossoms, I simply pulled off the stem and removed the pistil (i.e. the thing with the pollen on it) and then opened the blossoms so that they laid flat. I believe the recipe from Chow.com calls for blossoms that are still attached to the squash (or zucchini), but these are difficult to find. So I picked up several supplementary zucchini and squash as well, which I julienned into bite-size pieces. After the prep, the rest is simple: heat oil in a pan, let blossoms and zucchini fry, let ’em cool, and then enjoy. I provided some blue corn tortillas and crème fraîche to finish off the meal as well. And with that, a new low sodium, summer taco was born. 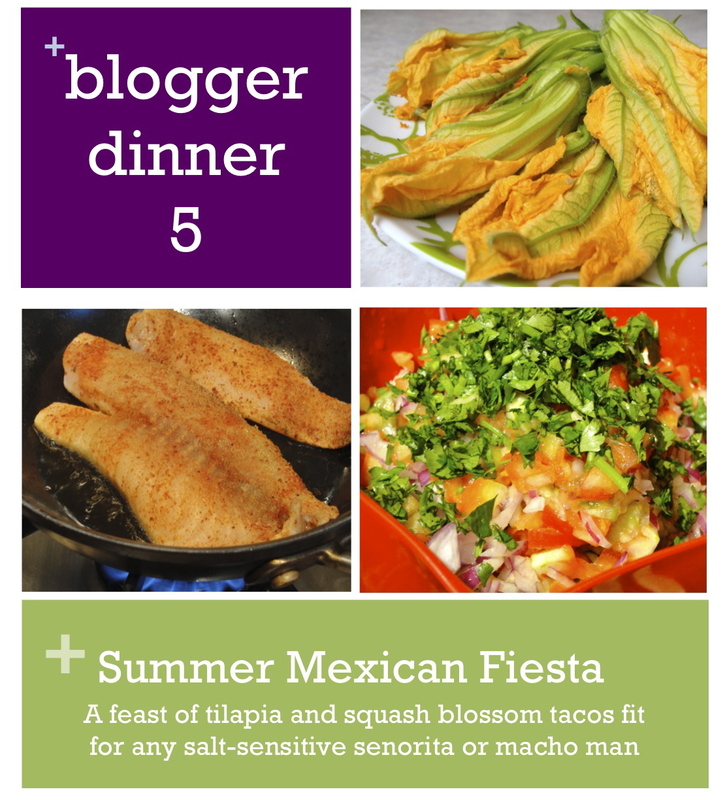 Below is the complete sodium free’d version of the Chow.com Zucchini Blossom Taco recipe for you to try. Since it is simple, don’t be afraid to add other spices or herbs. Want more garlic? Go for it! Need some spice? Make home-made hot sauce by roasting a few chili peppers and then blending them with oil.This recipe is a great start for your own at-home, low sodium Mexican experimentations. So have fun with it and don’t be afraid to get a little wild. Chow on. 1. Clean zucchini blossoms by gently twisting the pistils from the center of the flowers until they come off. Pull off the leaves at the bottom of the blossoms, and remove the stems. Using a damp paper towel, remove any dirt from the petals. 2. Prep the zucchini and squash, garlic, and onion. 3. Heat the oil in a large frying pan over medium heat. When the oil is spitting and ready, add garlic and onion and cook until softened, about 4 to 5 minutes. Add zucchini blossoms and cook until wilted, about 3 minutes. Remove from heat and place on paper towels. Season with freshly ground black pepper and smoked paprika. 4. Once you are done cooking the blossoms, add the zucchini and squash to the pan (add more oil if needed). Cook until slightly browned and softened. Season with black pepper, smoked paprika, cumin, and lime zest. 5. Layer tacos with zucchini and squash first and then divide blossoms among tortillas, placing in the center of each. Top with your salsa and add a dollop (or two) of crème fraîche.